It was Sunday and I went for a bite to eat in Hay on Wye. There are some very nice places for food to choose from. I have been many times to the Granary. It’s a lovely place to go for soup or tea and cake or breakfast. Why? It’s just the ambiance. I’m not the only one who thinks so, there are always plenty of customers there. No wonder, there is a nice open log fire and a cat who has its own little white fluffy rug on the window sill, right next to a central heating element. He is ever so cuddly. It gives the place such a homely feel. They usually do 2 or 3 different soups with a roll. You can help yourself to it and pay at the till where you also order your drink. Very friendly staff and if downstairs is too crowded, no worries because there is plenty of space upstairs where you can sit quietly and spend as long as you like. 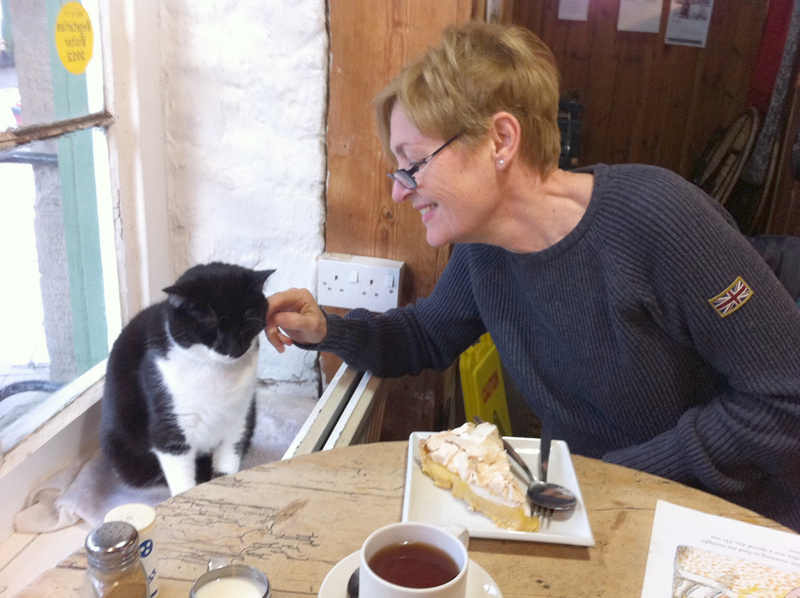 The Granary is a lovely place and the other day I had a slice of their lemon meringue for the first time… It was just heavenly. Contrary to my habit I did not go to the Granary yesterday, I felt it was time to try Oscar’s bistro. While wandering through Hay the other day I had walked past it. It’s opposite the Oxfam shop in High Town (odd street name). At first I thought it was a tea room so I did not go in because I’d just had lunch. So in I went yesterday. Oscar’s is also a real nice place ambiance-wise. A nice old wooden floor. Wooden tables and in the corner a bookshelf with second hand books for sale. Loos are upstairs and on going there I noticed that there is plenty more seating upstairs and also a very nice second hand book arsenal. Well, it is Hay of course, but still to find the love for books extends to eateries is a big plus to me. After a few days of not heaving eaten all that well, I decided I needed some veggies. So I chose the veggie meal of the day which was a coconut and vegetable curry with a choice of salad or rice or chips. I ordered the rice. It was simple and nourishing and nice. I liked it a lot. I had not noticed but it was help yourself to cutlery and stuff, however the friendly waitress did not mind at all getting cutlery for me. He told me he really liked their music and we had a nice chat about it. He said he actually had to pay in order to play music in his cafe to 2 different organisations. He said that should he have over 5 persons working for him in his kitchen and play music he would also have to pay for that. How weird a world is it we are living in? This entry was posted in House sitting, Tearooms by martineclausen. Bookmark the permalink.